The Ash City – North End Youth Compass Colorblock Three-Layer Fleece Bonded Soft Shell Jacket is available in Sizes S-XL. It can be purchased in your choice of the following colors: Black and Fossil Grey. SKU: AB-68009 Categories: Activewear, Fleece Jackets, Jackets, Jackets, Juniors & Young Men, Polyester Jackets, Waterproof Jackets, Youth Active Wear, Youth Warmup Jackets, Youth Clothing, Youth Outerwear, Outerwear, Soft Shell Jackets, Fleece Clothing, Shop by Color, Black, Grey Tags: fleece clothing, fleece jackets, polyester jackets, soft shell jackets, waterproof jackets, youth active wear, youth clothing, youth outerwear, youth warmup jackets, youth water resistant jacket Brands: Ash City. 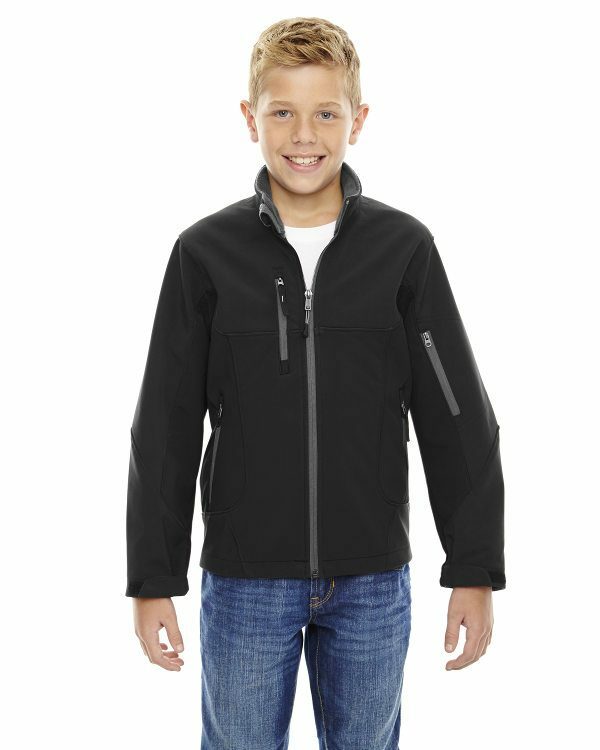 This Ash City – North End Youth Compass Colorblock Three-Layer Fleece Bonded Soft Shell Jacket is waterproof and bonded with 100% polyester anti-pill fleece and is suitable for youth.